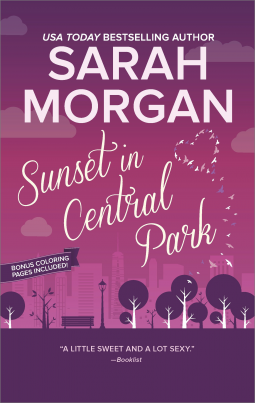 Sunset in Central Park by Sarah Morgan is #2 in the From Manhattan With Love trilogy. It is also linked to her Puffin Island series. That said you could read it as a stand alone, but like many a book in a series you would lose the richness and nuances of all the characters. I again really enjoyed the story of Frankie and Matt, they've been friends for years as Frankie has been good friends with his sister Paige since childhood on Puffin Island. Matt I suspect has long had an eye for Frankie but she hasn't been ready for a relationship. Her parents marriage broke up, she hasn't seen her father since and her relationship with her mother is problematic. However life and Sarah Morgan conspire to bring Frankie and Matt together in a story so well told. The pacing is great, if something is foreshadowed you the reader don't have to wait for half the book to be read through before it happens. It moves along, never drags and plenty happens. I loved the visit back to Puffin Island to witness the wedding of Ryan and Emily, such a nice touch. If you are a Puffin Island fan, you'll know how happy I was to return. Not so Frankie though, her memories of the place are not good, so don't ask her to go back there. I enjoyed seeing the business that Paige, Frankie and Eva have set up going from strength to strength. There friendship is strong. We get to glimpse Eva's sadness and I can only anticipate a great Christmas romance coming up for her soon! I know it will be good. Of course things don't all run smoothly for Frankie and Matt, but honesty, trust and good communication develop and that's something that I like to see between the main couple in a romance story. Frankie is a strong heroine, she is independent and can take care of herself, she doesn't need a man to rescue her, Matt is kind, compassionate and able to listen and wait. I enjoyed her ski resort series so I'd definitely give this series a try. I'll keep in mind to read the first book. New for me. Thank you for the update. Another author to try! Thanks for sharing, Kathryn, and I love books set in Manhattan.